The first weekend of spring and I am happy and always ready to go. Mom has been encouraging us to take morning walks and I just love them. However, Dad is not a fan as I still have my addiction to pulling. These parental’s have no clue as I want to explore and be the leader of the pack. 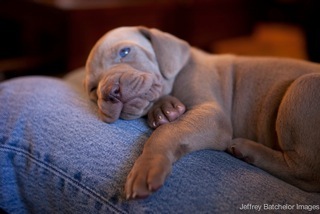 That is what us Weimaraners are known for in case you did not know. As for leader I have found my new thing which makes Dad even crazier…every chance I get I pull everything out of my crate and bring it all over the house. OK, I have been doing this for a few years now but lately when anyone touches my stuff I get out of sorts and have to run and wrestle it out of their hands. I am so on it that I can be dead asleep and just sense that someone is touching my stuff. But it does not end there…I know there are a few rugs that I am not allowed on, especially when I am eating a delicious bone. Yep you guessed it I got straight to these off limit spots and make a mess. I am still 3 years old so I have another year before I have to start acting like a grownup, since us larger breeds take the longest to grow up. Since it is light longer I have more daylight hours to cause craziness in the Dopart-Batchelor household. Thank goodness it cooled off and it was a very pleasant 66 degrees in Santa Monica today. 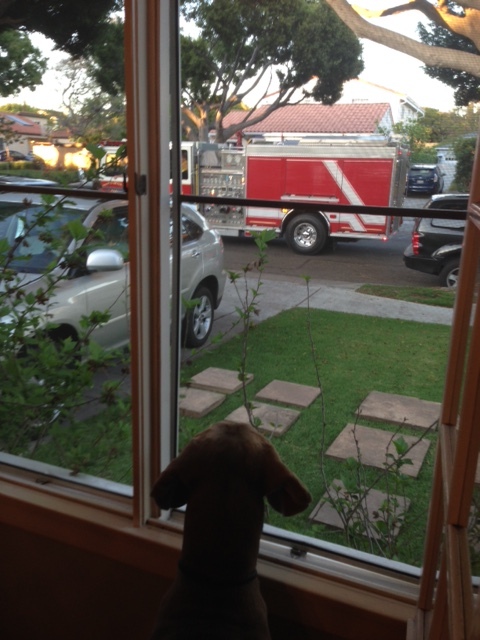 I thought I was going to die after all the cooking this week in our house. The new cookbook was in FULL gear with at least 10 new recipes and I am here on the cool kitchen floor asking for treats. I got a few but not sufficient for my needs – maybe later. I did sneak some gluten-free crackers and they were amazing! Is it SO HOT here PEOPLE! I cannot believe that we are having record high temperatures in March, and today is a whopping 90 degrees! This means in our old house it is in the mid-90’s and does not cool off at night. I know that the parentals are secretively loving this extreme heat because I cannot move…well I move from one area to the next and just plop myself down with a loud thud. I wish we had a swimming pool. I was surprisingly perfect this morning. Mom and Dad went out to church and left the crate open. I just hung out in there with the door open. They have been letting me roam around a little bit by myself lately and that is nice. I am trying not to cause too much havoc. 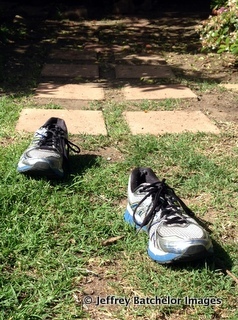 OK – don’t be worried my little campers as you can see I thought Dad was not paying sufficient attention to me so I brought both his running shoes outside again. He was really good about using his Fitbit last year and then abandoned ship and since today is the LA Marathon I figured I’d light a fire under his feet to get him going again. Then I thought I would give him an extra run for his money so while he was retrieving his shoes I took his tax pen and chewed it up. Yep- it is grumpy season because it is about taxes. So we are doing well, heat and taxes aside. If you haven’t checked out Mom’s most recent blog you should since it is a quite inspiring story about her road trip in snowstorm. This week I learned something new which made me realize just how precious life is. Our neighbor lady, Ann, passed away after 92 wonderful years of life. When Dad brought me over to meet her when I was just a pup, she was so happy and welcomed me into her home. She was lucky in this day and age to able to finish out her life in her home. You will be missed Ann and always thought of with love. Last weekend we missed our blog so sorry I have been out of contact. We were all a bit more than challenged since Dad was working hard dealing with the flooding in our back yard and Mom was way challenged trying to get o Arkansas to speak. Since it hardly eve rains in Santa Monica, when it does, it creates a lot of issues with our back yard and garage but Dad dealt with it and were okay and saved our books. Mom’s flight from Dallas to Arkansas got cancelled and she was stranded at the airport with no options to get to her speaking engagement. She told me she met some really nice people, one man in particular who was an angel and he offered to drive her and another woman to Arkansas in the snow, a 330-mile trip. Since Mom and I are alike in that we are not really “car people” I was surprised but it seems Mom’s life this year is about new adventures so she’s taking it in stride. Mom did her annual thing this weekend going to Natural Foods Expo. Dad and I stayed at home waiting for the new items while Mom and Victoria waded through the masses of excited foodies and you can see her new finds on her blog. 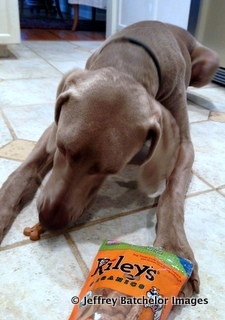 I am always excited to see what she brings ME home and this year I got to have a new treat from Riley’s Organics. 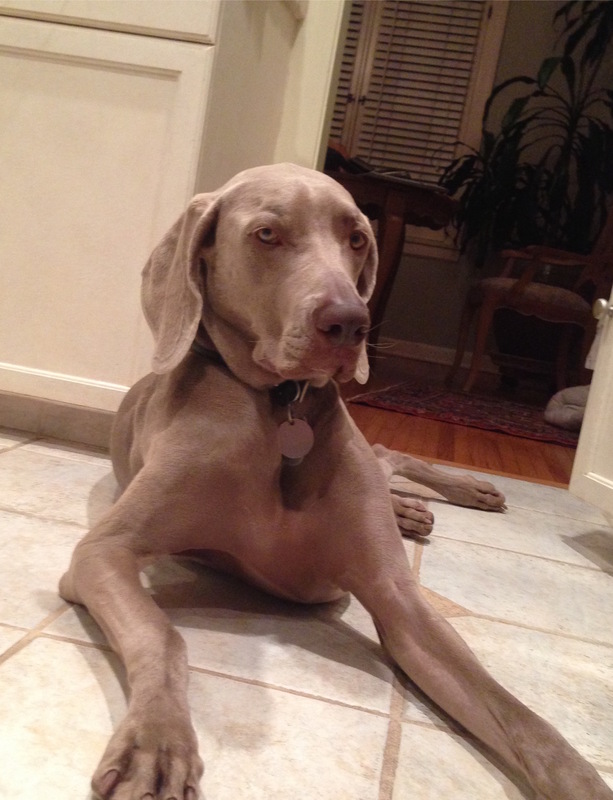 The nice man named Grant gave Mom TWO bags of treats for me – the Apple and Peanut Butter dog biscuits. Not only do they taste amazing, but more importantly they all organic, wheat, corn and soy free with no additives or preservatives. We all know what happened to me when I was given a dog treat at daycare that had wheat and preservatives – I almost died and had to go on all those drugs so I’m happy Riley’s is healthy for me. I needed a new fun tasty treat since Mom has been busy and remiss at making me the homemade one’s from A Healthy Baker’s Dozen – remember my picture and dog biscuit is featured there. So it’s that time of year ending Daylight savings where you “spring ahead” and I know the parentals love this as I sleep in a little more. It’s almost spring time and I can report a really lovely 75 degrees in Santa Monica today. I know – we have nothing to complain about compared to our human and canine friends in other parts of the country. My friends Katherine and John in Boston are having to make a practice of cleaning snow off their roof each weekend and I’m not so sure the parentals would ever be up for that so we’ll stay on the west coast for now.